A US study has indicated that younger internet users are losing interest in blogging and switching to shorter and more mobile forms of communication. The number of 12 to 17-year-olds in the US who blog has halved to 14% since 2006, according to a survey for the Pew Internet and American Life Project. It suggests they prefer making short postings on social networking sites, and going online on mobile phones. But the study also found a modest rise in blogging by those aged 30 and older. The increase from 7% in 2007 to 11% in 2009 is believed to be responsible for the prevalence of blogging within the overall adult internet population remaining steady at roughly 10%. As the tools and technology embedded in social networking sites changed, and use of the sites continued to grow, young people appeared to be exchanging "macro-blogging" for "micro-blogging" with status updates, it concluded. 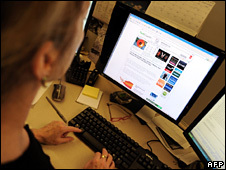 Amanda Lenhart, a senior researcher for Pew and the lead author of the study, told the Associated Press that the ability to do status updates had "kind of sucked the life out of long-form blogging". More young people - 55% of 18-29 year-olds and 27% of 12-17 year-olds - were also accessing the internet from their mobile phones, increasing the need for brevity. One student said teenagers had lost interest in blogging because they needed to type quickly and "people don't find reading that fun".